I’ve been trying out these two products – Vichy Idealia Life Serum and Vichy Liftactiv Serum 10 Eyes & Lashes over the past week or two. Prior to using these products I’d been using a regime that gave me a few dry patches on my face and so I was a little nervous as to how my skin might react. I also thought that it would provide a good challenge for the products. I used the serum after cleansing and toning day and night. I didn’t use a moisturiser with it as I wanted to be able to assess how well it worked as a separate product. The pump dispenser gives just the right amount to cover the face and it goes on really smoothly. It instantly makes your skin feel smooth and more taut. The look on the skin is similar to a high end primer and I felt that it was the perfect base for my make-up. I think that for night-time I would lean towards adding a night cream as well for a little more moisture. This Vichy Idealia Life Serum didn’t correct the dryness that the previous product had caused but that wasn’t the key aim of this product so I dont’ feel that I should take away from the smooth results that it brings. It’s available here for £25.45 at present – so grab it while you can! 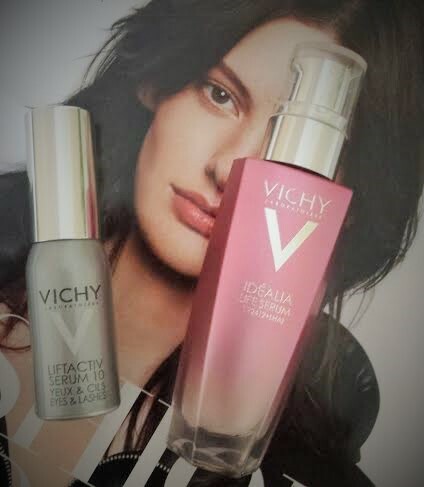 I’ve been using this Vichy Lift Activ Serum 10 Eyes and Lashes a little longer than the serum. I found that it’s as good as any of the eye products I’ve used and rated highly in the past. It feels cooling as it goes on. Its smooths out wrinkles too to make the lid ready for other eye products. I hadn’t really taken on board the fact that this is a lash product as well. Now I think about it though I have been noticing my lashes lookung better when I apply mascara and they feel much more strong and healthy to the touch too. It costs £21.25 currently here. Have you tried either of these products o can you recommned any that are better or as good but cheaper maybe? I’d love to hear from you.